Abdul Karim (third left) presents a certificate of appreciation to Temenggong Dato Vincent Lau where KTS Trading Sdn Bhd is one of sponsors for BCF, while (from right) Hii, Tiong, (from left) Siaw and Rogayah look on. SIBU: Minister of Tourism, Arts, Culture, Youth and Sports Datuk Abdul Karim Rahman Hamzah wants to see the Borneo Cultural Festival (BCF) to be elevated to Borneo World Cultural Festival in the near future. 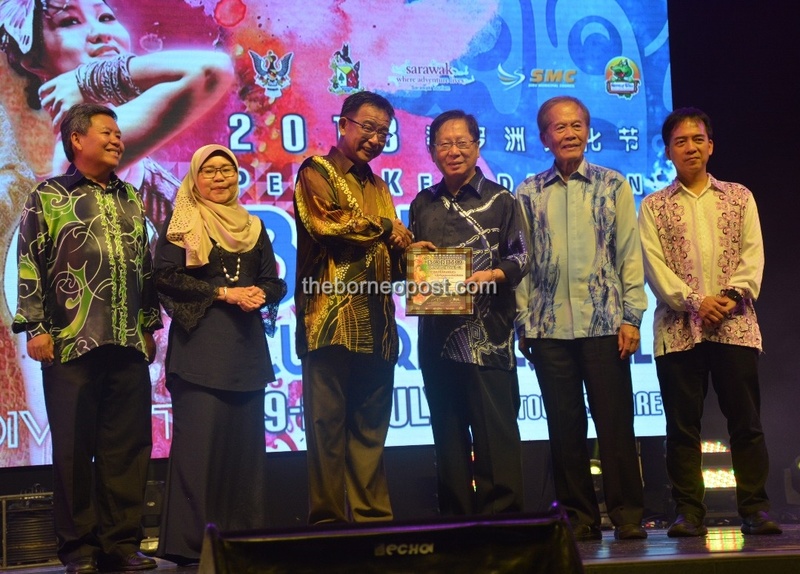 In this regard, he urged Sibu Municipal Council (SMC) to think bigger and turn Sibu into a global player, where diverse cultures and dances of the world can be brought here to be showcased to Sarawakians. Noting that SMC has forged friendship with many cities in China and other places, he suggested that the council invite all of them here to showcase their different cultures. Abdul Karim also assured of his ministry support in ensuring the intended event becomes a reality. “The BCF is into its 15th year, showcasing the diverse cultures that we have in Sarawak. We can become a global player to world culture – diverse cultures to be integrated into one place, where we can be entertained. “We can see how the cultures from China, Thailand, Indonesia, Myanmar, Africa and Europe among others are – all can be brought here to be showcased to the community here, ” he said at the closing of BCF last night. The event was held from July 19 till 28. Adding on, he said there should not be too much worries about the financing on organising an event of such magnitude although it is going to be very costly. Citing the Rainforest World Music Festival in Kuching as an example, he said it has brought out good return on investment – bringing smiles to operators of hotels, transportation and eateries. “These are the kinds of returns we would want to see. I strongly believe when SMC organised this BCF – a lot of those taking part like selling food – they would be very happy because of the good returns of the past 10 days. “Hopefully, SMC can also look forward, think bigger after this and try to probably, create and turn Sibu into a global player where diverse cultures and dances can be showcased to Sarawakians,” Abdul Karim enthused. SMC chairman Datuk Tiong Thai King also spoke at the function. BCF culminated with a spectacular display of fireworks. Permanent secretary to the Ministry of Tourism, Arts, Culture, Youth and Sports, Sarawak, Hii Chang Kee, SMC deputy chairwoman Rogayah Jamain and Sibu Resident Charles Siaw were among those present at the closing.